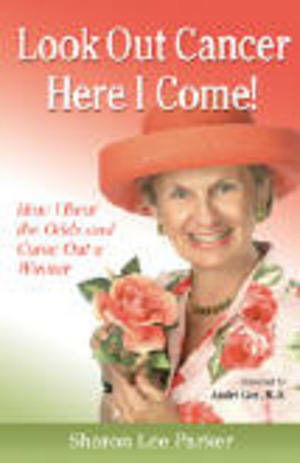 BCH independent books - Look Out Cancer Here I Come! Sharon Parker thought she had a bad case of allergies. Her primary care doctor agreed. But feeling instinctively that allergies were not the problem, Sharon asked for a lung x-ray. The x-ray results led to more tests and confirmed her worst fears. She had cancer. But if that news were not bad enough, Sharon soon learned that she had two, separate cancers--lymphoma and thyroid cancer. Determined to fight the diseases that threatened her life, Sharon sought out Dr. Andre Goy, internationally known hematologist oncologist at M.D. Anderson in Houston. Thanks to treatment, she is alive. -Misdiagnoses happen everyday. Follow your instincts to get more tests. -Don't be afraid to ask questions of health professionals. -During treatment, surround yourself with positive people. -Focus on today and plan for tomorrow. -Treasure each day. Remember that you are lucky to be alive. -Don't underestimate the power of a caregiver and those who offer help. Sharon is also raising money for innovative cancer research through her book and the Lover of Life Foundation, which she founded.